KXAN NBC Austin had a great highlight package of Saturday night’s opening UT win against ULM. Some great field level angles of the game and interviews with coach [tag]Mack Brown[/tag], [tag]Colt McCoy[/tag], [tag]Garrett Gilbert[/tag] and others. Don’t miss the blur that was [tag]DJ Monroe[/tag] at about the 1-minute mark. [tag]Eryon Barnett[/tag] – Played on defense late in the game. [tag]Marcus Davis[/tag] – Played on defense late in the game. [tag]Garrett Gilbert[/tag] – Came into the game to a standing ovation in the 4th quarter. Played one drive and led the backups to a nice touchdown drive. Looked poised in the pocket and moved well, completing 4 of 5 passes for 46 yards. Finished things off with a nice 12-yard TD run that showed he can do things on the ground as well. [tag]Marquise Goodwin[/tag] – Fast! The track start became a football scholarship player the moment he stepped on the field on a kickoff return. During Gilbert’s drive Goodwin showed that he can also do things as a receiver. Caught 3 passes for 39 yards, including a short hitch route that he took 29 yards and was a shoelace away from using his speed to take it to the house. [tag]Calvin Howell[/tag] – Played on defense relatively early. Got a lot of bad TV exposure as he committed two 15-yard penalties with a facemask and late QB hit. Finished with 1 assisted tackle. [tag]Barrett Matthews[/tag] – Played some special teams and was in at tight end on Gilbert’s scoring drive. [tag]Alex Okafor[/tag] – Played early and often on the defensive line. Okafor was one of the most active and impressive players on the Horns’ defense regardless of classification. Had 4 total tackles including 2 huge tackles for loss on a goal line stand. [tag]Kenny Vaccaro[/tag] – The first true freshman to play as he took field on game’s opening kickoff. Very active and looks like he’ll be key member of kick coverage teams all year. Tied for team lead in tackles with 6 including 4 solos. [tag]Mason Walters[/tag] – Came in and played on the line with Gilbert and the second team offense. It’s been a long, dry seven months since the Texas Longhorns last took the field to play some college football. The drought ends today as the team kicks off against [tag]Louisiana-Monroe[/tag] at 6pm to open the 2009 season. The Horns are 42-point favorites in the game, how do the editors of 40 Acres Sports think the burnt orange will fair in the season opener? 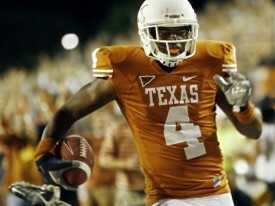 texascmj5: Colt 220ps yds 2TD – 75 rush yds 1 TD – McGee 125 yards rush w 1TD score 42-10 – don’t care if I’m right want the W! Not the news you want to hear three hours before the opening kickoff, but three important Longhorn contributors will miss at least today’s game due to academic issues. Wide receiver [tag]Brandon Collins[/tag], safety [tag]Christian Scott[/tag], and cornerback [tag]Deon Beasley[/tag] are out against Louisiana-Monroe today because of “unresolved academic issues”. All three players would have seen significant playing time today, particularly Collins and Scott. Fortunately receiver and secondary are two of the Horns’ deepest spots. The academic issues appear to be with the NCAA requirement of progress towards a degree, and the reason the news is coming so late is that the players are likely appealing grade decisions to the university. This could be a one game issue or these guys could miss the entire season. There were rumors about Collins and Beasley, but Scott surprising. He was getting a lot of love from the UT coaches and I find it hard to believe [tag]Will Muschamp[/tag] gives him so many first team snaps at safety if they expect him out long. (13) Georgia at (9) Oklahoma State (-5.5) – 3:30 PM EST on ABC. Oklahoma State is starting the season with the highest ranking in school history. A few years ago Oklahoma State got absolutely killed in their season opener and will no doubt be looking for some revenge. This is OK State’s chance to show just how much they have improved and that they are ready for the big stage. I Georgia has too many question marks and OK State wins this one pretty easily. Give the points. (20) BYU at (3) Oklahoma (-22) – 7:00 PM EST on ESPN. Oklahoma is known to start of the season a little slow, but I expect them to finally learn from their previous mistakes and take care of business here. By now you have probably all heard of Gresham’s injury, but I don’t see that being a huge factor here, Oklahoma just has too many weapons on offense. I don’t like the 22 number, but I would go ahead and give the points here. Louisiana-Monroe at (2) Texas (-42) – 7:00 PM EST on FSN. Wow, another 42 point spread season opener. Obviously this game won’t get much national attention, but it is always good to try and get some opening season questions answered. Has the defense matured from last year? Who is going to step up at running back? Now I almost never bet on Texas, but even with the 42 points I think Texas covers this easily. Look for something in the neighborhood of 59-7. (5) Alabama at (7) Virginia Tech (+6) – 8:00 PM EST on ABC. You can’t start the season off much stronger than this night-time battle of top tens. Virginia Tech is also coming in with their highest ranking in school history and has a few question marks after some injuries this preseason. Alabama started off last season better than anyone, but fell short in their last two games. Saban hopes to start erasing those bad memories with a big win tonight. Virginia Tech is starting a freshman at QB and RB. In my opinion that spells trouble against the Alabama defense. I think Alabama covers this spread, though it might just be by 1. Give the points here. Can Dan Buckner be a weapon as a flex tight end? Texas won’t need career defining games from the likes of [tag]Colt McCoy[/tag], [tag]Jordan Shipley[/tag] or [tag]Sergio Kindle[/tag] in order to win Saturday’s game. But for some of the players on the roster the first game of the 2009 season is more important. In the season’s first game there are several new names and veterans to keep an eye on who could play critical roles throughout the 2009 season. 1. [tag]Vondrell McGee[/tag] – The junior is getting the opening day start for the second year in a row. An injury early in the season made the Longview natives sophomore season less than spectacular. The Longhorns don’t want McCoy to lead the team in rushing again, and McGee appears to be the top candidate to handle the load. A big game Saturday makes him the clear first team running back. A subpar game keeps Texas’ number one question unanswered. 2. [tag]Dan Buckner[/tag] – This might shock many, but if Buckner shows up big on Saturday the tight end concerns may be on the way to being over. The sophomore isn’t a true tight end, but if he can control the middle of the field as a receiver he gives the Longhorn offense a wrinkle many didn’t believe they’d have in 2009. If Buckner can just hold his own as a blocker, Texas’ offense becomes multiple, and the running game will flourish. 3. [tag]Keenan Robinson[/tag] – Robinson we’ll get his shot at becoming an impact player this Saturday. In limited action Robinson has shown the ability to make plays. In the spring, Robinson showed the ability to play the pass as well as the run. He also can blitz. If Robinson can play smart, and hold his own against the run, I think he becomes the clear starter at the strong side linebacker position. His ability against the pass will keep him out there in nickel packages alongside [tag]Roddrick Muckelroy[/tag]. 5. [tag]Kheeston Randall[/tag] – We all know what [tag]Lamarr Houston[/tag] can do when he is healthy. Not many around the program are as sure about the other defensive tackles. [tag]Ben Alexander[/tag] will get some snaps, but he doesn’t offer the athleticism that Randall does. The sophomore was heralded coming in, and it is time to prove why. Texas won’t face many teams that are going to ram it down their throat, but an up the middle pass rush is the best way to disrupt timing quarterbacks like Sam Bradford and Taylor Potts. The Longhorns need another three technique to step up, and if it isn’t Randall the next person in line is a true freshman. 6. [tag]Christian Scott[/tag] – I truly believe Will Muschamp wants [tag]Earl Thomas[/tag] to play the slot when the Longhorns are in the nickel defense. With Thomas at the slot Texas doesn’t give up anything in the run game, and it allows the Thomas to blitz. The only way this can happen is if another safety steps up. Scott has the more raw ability than anyone in the secondary except Aaron Williams. He has played so well that he might replace [tag]Blake Gideon[/tag] in the starting lineup even when they’re not in nickel. The knock on Scott is his work habits and attention to detail. If he proves to be a smart player, Scott has the chance to emerge as one of the best players on the team. 7. [tag]John Chiles[/tag] – This is a huge game for Chiles in my opinion. How much, or how little, the former quarterback sees the field will illustrate the overall plans the Texas coaching staff has for him this year. There is little doubt Chiles is one of the most explosive players on the roster with the ball in his hands. But he has to be behind his teammates in route running ability. The fact he was a quarterback will help him with mid route adjustments and identifying coverage. But the Longhorns are loaded at wide receiver, so Chiles is going to have to do something special to earn more snaps. 8. [tag]Tray Allen[/tag] – The word is the big man may play both ways this Saturday. I’m not sure if that means the experiment at defensive tackle is going better or worse than expected. But if Allen does go both ways, a good showing at one or the other could determine his future on the 40 Acres. If he struggles on both lines, Allen may end up being the biggest bust in Mack Brown’s Texas history. 9. [tag]Garrett Gilbert[/tag] – I almost put [tag]Sherrod Harris[/tag] here instead but I’m not sure he even sees the field. I am positive that true freshman Gilbert will see the field though. 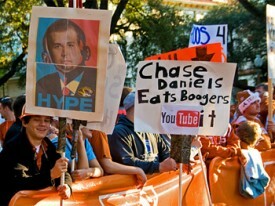 Texas has too many eggs in his basket not to throw him out there early in the season to see if he can handle it. A good game Saturday more than secures Gilbert the role of backup quarterback. Struggles on Saturday will lead to concerns about Texas’ lack of quality depth behind [tag]Colt McCoy[/tag]. Like it or not, Texas is one freak play away from having a potential national championship season riding on the arm of a true freshman. If he can’t handle it against Louisiana Monroe, when will he? 10. [tag]Charlie Tanner[/tag] – The clock is ticking for Tanner. And the man waiting for the time to run out is [tag]David Snow[/tag]. Frankly, Snow is too good to not be on the field. On paper, Tanner is the weak link on Texas’ offensive line. It may be a waste of time debating starters along the offensive line because of Texas’ desire to rotate the group, but the fact that Tanner is above Snow on the depth chart does raise eye brows. If Tanner slips up too much he may even lose snaps to true freshman Mason Walters. 11. The kickers – It has not been announced yet who will be the kicker for Texas. Both [tag]Ryan Bailey[/tag] and [tag]Hunter Lawrence[/tag] have performed well. Word is [tag]Justin Tucker[/tag] has also performed well when given the opportunity. Right now it appears to be a game time decision, but logic suggests both kickers will get work in what most would assume will be a one sided affair Saturday. It may not be who does anything spectacular that secures the job; it may very well be the first kicker that misses will lose the job. If one misses a kick or two, and the other goes perfect, the starting kicker will be decided. If they both struggle, or both go perfect, next week’s starter will be another game time decision. The 2009 football season is less than 12 hours from getting underway as several games kick off Thursday evening, including two matchups featuring top 25 teams. 9:15 tonight on ESPN will be first football most ravenous fans get to see and it’ll be between two highly ranked teams in Oregon and Boise State. Should be a fun watch. The Longhorns’ season kicks off against Louisiana-Monroe in just two more days. T-minus 57 hours and counting! Can you feel it?! Vondrell McGee gets the opening week start, is he the answer at running back? So we know what we know about this year’s team (channeling my inner Aflac commercial). Texas has a Heisman Trophy candidate at quarterback, experience at every position excluding tight end and Will Muschamp is a deity. We got it. But what don’t we know? Even with the high expectations, there are some unanswered questions that could grow into concerns as the season moves forward. 1. Will a running back step up? The same question was raised prior to last season. The question went unanswered all season, and Texas still was one second away from playing for a national title. Heading into the offseason, and into spring practice, the word was Cody Johnson had stepped up and was ready for 20+ carries a game. That was four months ago. The week of the game, it appears the team is exactly where they were one year ago. Vondrell McGee will get the first look, Fozzy Whittaker is showing flashes of talent when he isn’t hanging out with the training staff and Cody Johnson is great in short yardage but not in shape enough to handle the load. The loan difference is new comer Chris Whaley. The true freshman was given every opportunity to take the starting spot, but his weight and the adjustment to big time D-1 football is proving tough. Texas may not have to run the ball to be successful, but Mack Brown sure wants to. If this team can establish a run game in Lubbock who knows what would have happened. McGee has the talent to be the lead back. The question is will Greg Davis stick with him consistently enough for him to prove it. I’m not sure Davis, or Brown, know the answer. 2. Can Texas play without a tight end? If a team is going to have a string of tough injuries, it might as well all happen at one position. Especially at a position that last year’s group proved they didn’t need for the majority of snaps. But the loss of Blaine Irby, DJ Grant, etc., etc. may give Texas no choice but to play without a tight end. Despite the success of last season’s offense, the Longhorns need to be able to line up with a tight end in passing and rushing situations. Without the option teams will know what kind of play is coming by the personnel that are on the field. Texas is too good for most teams on its schedule to compete either way, but in the big games the Longhorns need the flexibility. Especially with an offensive line that has proven to be road graders in the run game. Dan Buckner has stepped up. And Greg Smith is still around to block and deflect balls to the other team. But neither is an all around tight end that can block and stretch the defense. The Longhorns offense works best with a pass catching tight end, so Buckner is the odds on favorite to win the job. But he has never had to block at this level, and it hasn’t been proven he can stay healthy while taking on defensive ends and linebackers on a play to play basis. Texas will field a good offense either way, but without the threat of a tight end they simply can’t be one of the best two teams in the country. 3. Is the lack of depth at defensive tackle a real concern? For most teams in the country this would be an easy yes, but in the Big 12 I’m not so sure. And how bad can the depth really be when you’re Texas? Most fans, and coaches, around the country would kill for Lamarr Houston, Ben Alexander and a couple of big time recruits to enter the season at defensive tackle. Texas has been spoiled at the position over the last decade. It seems like every year Texas has two or three big guys in the middle that are sure fire NFL guys. The difference this year is the fans aren’t aware of the other two yet. Meet Kheeston Randall and Calvin Howell. These two young guys have the talent, and Randall has the years in the program to make a splash. Howell isn’t ready to compete every down, but he can help out in spots. That is four guys right there that can give you snaps, and one of them is an all-conference caliber player in a conference where maybe two teams try to run up the middle on a consistent basis. If that is the biggest question mark for the defense, Big 12 coaches are in trouble. 4. Are Keenan Robinson and Emmanuel Acho ready? Roddrick Muckelroy won’t leave the field. Jared Norton is a senior, and will anchor the middle, but what about the other outside linebacker spot? And maybe more importantly, who will play in nickel packages? The answer to both questions is either Robinson or Acho. It may be both. The two sophomores are battling for the starting spot with Robinson slightly out in front. Robinson is an aggressive player with the athleticism to play the pass as well as anyone in the linebacking unit. That strength may make him the starter because of the types of offenses Texas faces on a consistent basis. Acho is a smart player with the ability to blitz. Sounds like a Muschamp guy to me. Norton has struggled on passing downs. He has also struggled with injuries this preseason. If one, or both, of these guys step up when the real games begin the Longhorns will be in excellent shape. 5. Can Texas replace the leadership of Brian Orakpo, Quan Cosby and Roy Miller? Yes, Texas has Colt McCoy and Jordan Shipley on offense, but what about defense? Sergio Kindle is the best defensive lineman, but he is admittedly not the public speaking type. Muckelroy leads the linebacking unit, but he does it quietly. And the guys in the secondary are finally comfortable with the layout of the campus. So who is the guy? Muschamp says Lamarr Houston and Earl Thomas. I think Houston emerges this season as one of the best players in the conference. And I think Thomas plays so well the chatter of leaving early starts, well early. And both of those predictions are based on Muschamp’s perceived leadership out of the two. It is hard to be a great player without being a great leader. It is not impossible, but I think it is hard. Houston has the ability when he is healthy. Thomas has improved a ton from last year to right now. The talent is there, if the leadership competes with what the Longhorns have on the offensive side of the ball then the comparisons to the 2005 championship team may be fair. If no one steps up, Texas will drop a game they shouldn’t.